TEMPTED: Oops. Impulse-bought a cult sewing machine last night on eBay…. 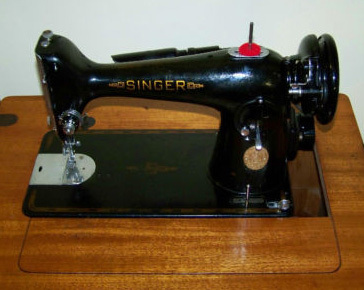 a Singer 201k from the 1940s in a very cute little cabinet. Drove and drove and drove and drove to the outer burbs to pick it up where the seller has a shed full of machines he tinkers with because, he said, it’s occupational therapy that balances out his sitting behind a computer all week doing data entry. Anyway, it’s charming and beautiful and a very fun new toy. And there is a wealth of Singer geekery online… people who clean them and people who fix them (and teach you to fix your own) and apparently if you tell Singer a nice story, they’ll give you a shiny new 160th anniversary commemorative machine. CONFLICTED: Melbourne’s mecca of suburban consumption, Chadstone, is hosting an exhibition of Mad Men costumes next month. Want to see. Never been to Chadstone and hoped never to go. Am torn. Perhaps with some moral support, I can brave the nightmare that is the giant shopping centre. Anyone wanna come? Do they even have public transport out there? The ever-hilarious, blasphemous and foul-mouthed Regretsy maven, Helen Killer, has come up with the best sewing machine infographic of all time. I’m getting one of these on a t-shirt.